The $3 billion San Antonio Federal Credit Union just wrapped up hosting a series of four workshops for local college and university counselors and representatives of the Texas Guaranteed Student Loan Corporation. 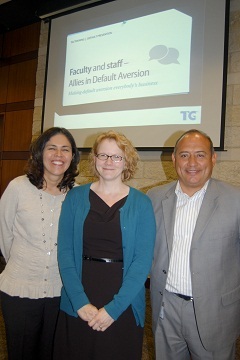 SACU’s Juan Antonio Ruiz welcomes TG representatives Maria Luna-Torres, left, and Cindy Marrs at the first session. The $3 billion San Antonio Federal Credit Union just wrapped up hosting a series of four workshops for local college and university counselors and representatives of the Texas Guaranteed Student Loan Corporation. The sessions were to train counselors about how to effectively counsel students about their student loans. They were held in San Antonio, Dallas-Fort Worth, El Paso and Edinburgh in the Rio Grande Valley.